Sales and Marketing Director at the Nevis Tourism Authority (NTA) Devon Liburd, described the first annual Mango Madness Festival hosted by the Authority in collaboration with the Department of Agriculture as a success with expectations of an even greater event in the future. In an interview with the Department of Information Liburd explained that the Festival was hosted as a collaborative effort between the Nevis Tourism Authority and the Department of Agriculture. 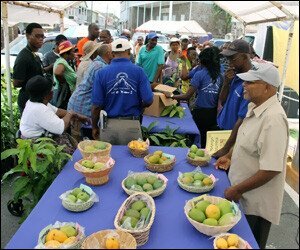 The Festival featured mango-inspired products from Dypresco, Ermine Hendrickson, the Department of Agriculture’s Agro-Processing Unit, Yvonne Rogers who sold her hand-made craft items and a group from St. Kitts who sold mango pastries. “This year we chose to celebrate in the months of June and July as a celebration of mangoes and this is one of the events that we are having, a street fair dubbed “Mango Madness” with products all related to mangoes. So far the event has been quiet a success we have a number of booths. The day has been a wonderful day so far and it only means that next year will be better,” he said. Also present at the Mango Festival was Forestry Officer in the Department of Agriculture, Floyd Liburd who explained that as a part of the mango festival the Department made mangoes and fruit trees available to the public. Liburd stated that the Department also hosted a grafting demonstration to teach the members of public how to graft and maintain a mango tree.Â The Department of Agriculture also had on sale A Mango Recipe Book which listed the local varieties of mango and provided a variety of recipes for mango delicacies.